BERLIN (Reuters) - Six years ago, weeks after U.S. investment bank Lehman Brothers collapsed, European leaders gathered in Paris to discuss a joint response to the financial earthquake shaking their continent. France and several other states pushed for the creation of a European fund to help the bloc cope. Germany's Angela Merkel ruled out a common approach, insisting that each country come up with its own plan to combat what would turn out to be the worst financial crisis since the Great Depression. In his new book "Is Europe Failing? 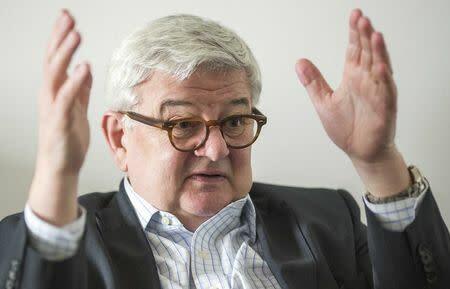 ", former German foreign minister Joschka Fischer traces what he describes as a dangerous unraveling of the European project back to the events in Paris in October 2008. The decision represented a break with decades of post-war German policy and has set the bloc on a perilous path of "renationalization" that could tear it apart in the years to come, Fischer believes. At home, Merkel is hugely popular for her defense of German interests during the euro crisis. But Fischer sees a reactive chancellor who instead of rallying skeptical Germans behind Europe, has unwittingly turned them against the bloc. "The big question is whether we are moving towards a German Europe or continuing on the post-war path of a European Germany," Fischer told Reuters in his office overlooking the Gendarmenmarkt square in central Berlin. "Even today no one knows what Merkel's goal is, what Europe she wants to have," he said. Merkel's supporters point to the fact that as Europe's dominant politician she has presided over a turbulent period during which political will has consistently been summoned to keep the euro zone together, confounding the expectations of many doom-mongers. Fischer, 66, has been out of politics since 2005, when Merkel ended his seven-year reign as Germany's top diplomat and vice chancellor by narrowly defeating Social Democrat Gerhard Schroeder. During his time in office he broke with the pacifist traditions of his Greens party and supported sending German troops to the Balkans, the country's first foreign combat operations since World War Two. Along with Schroeder, he opposed the 2003 U.S. war in Iraq, famously staring down Pentagon chief Donald Rumsfeld at a conference and telling him: "Excuse me, I am not convinced". In recent years Fischer has been criticized in the German media for betraying his roots as a student activist and founding figure in the environmentalist Greens by accepting corporate sponsorship deals with firms like carmaker BMW. 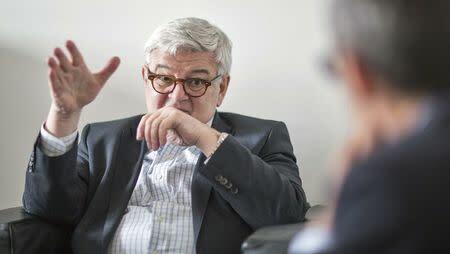 But he remains one of the most respected German voices on foreign affairs and his strong criticism of Merkel's course comes at a crucial time when Europe looks on the verge of sinking back into crisis. Despite a weakening economy at home and in Europe, Merkel and her government remain focused on consolidating the German budget, putting Berlin on a collision course with its partners. "If you look at the economic figures, one has to ask oneself how much longer the austerity policies can continue, whether they will survive the first half of next year. I have serious doubts about that," said Fischer. "We are at a key moment, with Europe emerging once again as the weak spot in the world economy. German policy has to change," he said. Without a common approach, he predicts the bloc will face a political crisis in which anti-European populists like Marine Le Pen of France's National Front and Nigel Farage of Britain's UK Independence Party gain the upper hand. More Europe is also his answer to the Ukraine crisis. In his book, Fischer calls on Germany to revive the idea of a common European security and defense policy and to invest more in joint European arms programs. The EU needs to completely rethink its relations with Vladimir Putin's Russia, Fischer argues, reducing its dependence on Russian gas through the creation of an "energy union" that mutualizes supply risks. "Germany is as strong as it's ever been since the founding of the Federal Republic in 1949, but in relation to the rest of the world we are in economic decline, just as France and the UK are in political decline in power terms," Fischer said. "Europe is our best investment. We would be the biggest losers if we allowed the project to fail."